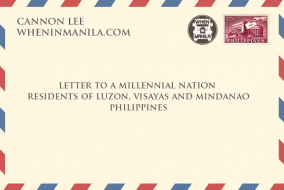 Cannon Lee is a writer for When In Manila.com and millennial that embraces and shares personal excellence. He is a multi-awarded personal and professional development broadcaster, co-founder of a multi-awarded radio program - My Light Radio, and a neuro-linguistic programming practitioner as well Head of Events Management for NLP LifeSets. To fill his schedule between broadcasts, he does inspirational public speaking engagements for schools, companies, and organizations. He firmly stands by and advocates that positive social change is what makes society better and he will do everything he can to be of positive contribution for unleashing people’s fullest potential in their personal and professional life! He believes we can only change the world one person at a time and lives by the slogan “become the change you wish to see”. His greatest fulfillment is watching people grow and succeed in life!